Counting Coconuts: August Sensory Tub & Playdough - Ice Cream! This tub makes me smile whenever I look at it - it's so soft and colorful and it's all about ice cream!! :: Sprinkles - because of ants, humidity and what's sure to be sticky fingers I'm keeping these sealed! This dough is so much fun to play with - James LOVES it! It smells delicious and the colors look so pretty all mixed together. :) Oh and bonus, all that tearing and pinching of the dough is excellent for strengthening those little fingers! Now for the pom-pom tutorial. These are SO quick and easy peasy to create - each one took me only a minute or so to make. I remember making these with my sister when we were kids. This would be a fun activity for children who know how to cut and tie. :: Yarn - this is a great way to use up leftover bits. I used whatever I had on hand, but I would recommend chunky weight yarn for these. Wind the string around the cardboard. Using the chunky weight yarn, I wound approx. 25 times around. Cut the yarn and then cut another 6 inch piece of yarn. Slide the yarn "ball" off of the cardboard, being careful not to unravel the loops. Gently center it on top of the 6 inch piece of yarn. Use the 6 inch piece of yarn to tie a tight double knot in the center of the yarn "ball". Using your scissors, cut the loops - make sure you DO NOT cut the knot you created in Step Four. Trim and fluff the edges so they are all fairly even. That's it! You now have a happy little pom-pom! I'm linking this post up to The Preschool Corner, Tot Tuesdays, Montessori Monday, We Play and Creative Friday. You've got to be one of my favorite blogs at this point! So cute. You could make 'cones' with construction paper. And for 'sprinkles' we've got lots of beads and sequince from another project that should work! That looks like so much fun! I really enjoy reading about all of your sensory tub ideas each month. Sophie does too! I did pick you up a few packs of pompoms at the dollar store the other week, so I am glad that you don't have a ton of them! What an easy way of doing that. I always did in a much more complicated and time consuming way when I was a child... Thanks! This tub literally looks good enough to eat! James is so very lucky to have such a creative mommy. I am definitely going to be making this sensory tub and the playdough! Very cool. Thanks for visit my blog and for remind me how to make pom-poms (I used to do them when I was child). For sure I will make some for my son. I forgot to write that I remember making pom poms like that when I was a kid! Thanks so much for the link back to my site! And i love your homemade pom-poms- cute!! I love the spumoni play-doh.. I wish I could smell it through the screen! Great ideas both of your two projects, the sensory tub and the playdough. I am trying to convince my cousins who are young mothers to work with this method with their little children, because I think it is great. Thank you for offering your help a little time ago, I forgot to write you back saying thank you. I am in love with that sensory tub! B would LOVE that! I can't believe you MADE all of those. Wow! That's awesome! What a great sensory tub idea, I have to yet include these for my tot and preschooler, but this makes me want to start today. Thanks! What an amazing way to make pompoms! How much fun! I didn't realize that making pom poms could be so easy. Very cute idea - I could see my 4yr old spending a lot of time with this! Love, love, love this! I can't wait to get into my stash of yarn and make some pom poms! What a great idea for a summertime sensory box! How cool! Love this...the sensory tub is great, as is the ice cream playdough. The boys sometimes like to play ice cream shop on our lanai, so this would be perfect. I've had to bookmark because I know I will forget how to make the pompoms! Thank you for the sensory tub idea! 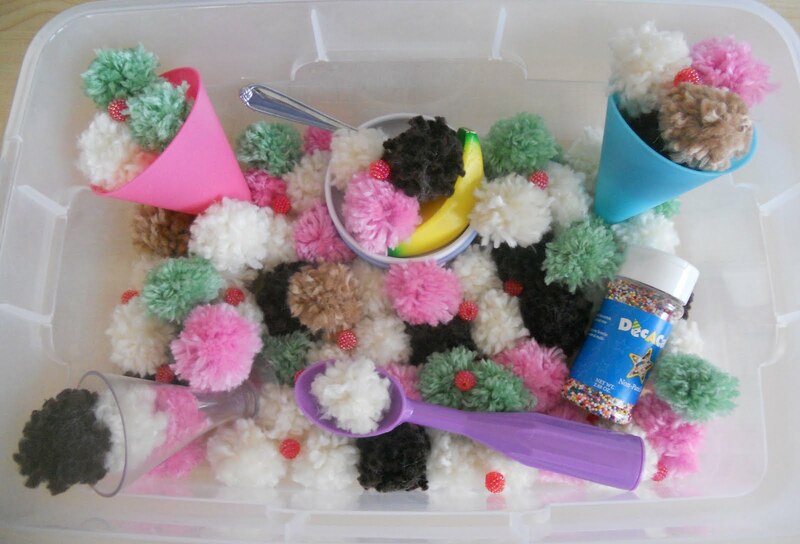 I never thought of using pom poms, most sensory tubs I see use beans or rice or water. I am planning on doing monthly tubs wiht my son for tot school this year and I am adding this idea to my list. Thanks for the idea of making my own pom poms as well. super cute!! followed the link from Activity Mom and I'm sooo glad I did!! :) love this idea! thanks! I bet those pom poms are so soft! I love your idea of making a new set of playdough and a sensory bin for each month. Fun for kids and mom! You've inspired me to do the same. This month I did yellow playdough with gold sparkles for a "sun" playdough. It's been sooo long since I made pom poms. I love your sensory tub, the cones were a fabulous find! This is right up my alley! Love it! Thank you for adding this sensory bin post to our linky this week. :) Want to know something? I got this post in my subscription mail when it was originally posted. Loved it. And we did it with pom poms. She loves it too! :) So, thank you for that too! Thank you so much for inspiration. Sensory table is one point in my classroom that I struggle with. We (my daughter and I) took this idea but changed mint to Lime. We also made an Ice Cream shop menu. I would like to send it to you if you would like. My email is tirzahdawn@yahoo.com Thanks again for the inspiration. This is the first post I see of yours and it's so creative. You really put a lot of thought into it and didn't leave anything out! I'll be keeping this idea on hand for summer and ice cream themes. Do you have a twitter account for those of us who could follow your blog posts through there? Just love this idea!! Thank you so much for sharing how to make the pom poms! !